I WANT TO have a blog. It would be part car column, part urban farmingwith recipes, of course. I went so far as to click "Get your own blog" on my sister's blogspot, but the program wasn't compatible with my Mac, so I didn't get much further, and eventually I wandered off to make some cookies. You can see what kind of burning ambition I havequick, look away, or you'll be blinded. Now my blog fire has been rekindled because of the recent Detroit and L.A. auto shows, neither of which I attended. I comforted myself with the fact that I didn't have to go anywaybecause of the mighty blog. Autoblog.com was all over the shows and included a great video of the now legendary Jeep smashing through the window at the Detroit show and climbing that giant Jeep sign, and Chrysler's head honcho alighting from the vehicle in victory. They also featured photos of the cute little Tilda (available in the United States in six months or so), made by Nissan. Other interesting models included Nissan's concept carUrgethat features a partially see-through door, cell-phone docking stations, and an Xbox gaming system. See, I really didn't need to fly to either God-forsaken city. I just sat there and read the feedswhile the crazy events happened. Like the Chrysler Imperial's tragedy involving a red carpet that wouldn't stay down and Eva Longoria's flubbing her lines as Chrysler's glorified car model. I love Autoblog's polls, too. Like the "Unfortunate or Fabulous" ratings of Chrysler's Imperial, which found that 65 percent of the 3,000 people polled chose Unfortunate. Blogs are refreshingly candid and aren't as beholden to corporate automakers as standard auto journalists can be. However, auto manufacturers have caught on and are making their own blogs. And it should come as no surprise these are being used as marketing tools, not necessarily for insider information. GM has a slick little number at http://fastlane.gmblogs.com. The tone is glib and cheesy. Consider this posting, supposedly written by Bob Lutz, GM vice chairman, but more likely typed up by a PR staffer at GM: "Well, by now, many of you have seen the hoopla unfold before your very eyes on our webcast (if not, you can view it online), and the secret is finally confirmed: we introduced a Chevrolet Camaro concept car. If I had a dime for every time I've read the word 'Camaro' in your comments on this blog in the past year, I could have financed the concept car out of my own pocket! And I would have ... I like it that much." Wow, it's so intimate, so revealing, so funny! Barf. Chrysler also has a few corporate blog sites. One is for the public use. 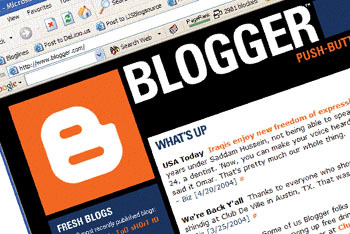 This site (www.chryslerweblog.com) is a pastiche of faux-blog language. Take, for instance: "You have seen the photos ... now check out the video of the 2007 Jeep Wrangler in action. What do you guys like the most about the new Wrangler?" There's just something so dishonest about a fake blogwhat do you guys think? Chrysler, though, has another blog, only accessible to media. I gained access and had a look-see at www.thefirehouse.biz. It's called Firehouse because, according to the blog, at the Detroit auto show the press hangs out and schmoozes with auto execs in a remodeled firehouse. The blog assures us that "we will provide written transcripts of the executive interviews to make it easier for print journalists to pull quotes without having to listen to the podcast." Oh, thank God, we won't even have to think critically! What may be revealing is Ford doesn't have a blog site. Well, it didhttp://blog.ford .com/BLOG.CFMbut it hasn't been updated since late August. This would be my biggest fear in keeping a blogit's like a pet: you have to keep feeding it, or it's dead. Perhaps the authors of the blog, the Mustang unit at Ford all got pink slips? I'll be watching the Chicago auto show (Feb. 10-19) from the comfort of my computer terminal.